I guess the truth of these claims is subject to change. Thanks Jo. The bag appears to have a transparent window behind which a leafy green substance is visible. Given the fact that potato greens are poisonous to humans (do not eat potato sprouts!) it seems that they put the quotes on the wrong thing. 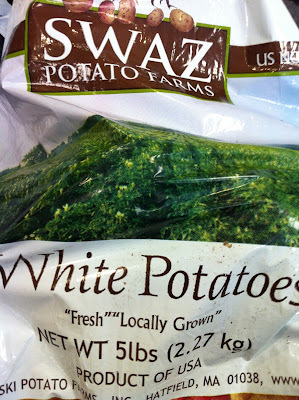 Although they may simply have forgotten to put the quotes around the "White Potatoes" as well.